There has been a lot of buzz around the Seattle City Council’s historic adoption of a $15 minimum wage, the highest in the nation. Now there’s also excitement over last week’s passage of a living wage ordinance by the King County Council that sets the same wage floor for county employees and contractors. Yes, $15 is more than twice the federal minimum wage, which stands at a paltry $7.25 an hour and that Congress has failed to increase for five years and counting. But despite the recent local victories, let’s not hang up a “Mission Accomplished” banner just yet; we still have a long way to go. In this debate, some have argued that $15 is too big of a jump. On the contrary, it does not go far enough. First and foremost, $15 is not enough for King County families to meet basic needs. In August, the Alliance for a Just Society and Washington Community Action Network jointly released “Families Out of Balance,” which calculates basic expenses for King County residents. Meanwhile, if you can’t make ends meet, it’s not as simple as just finding another job. Another study the Alliance released last year found that, for every living wage job for a single individual in Washington state, there are eight job-seekers. For a single parent with two kids, there are 21 job seekers for every living wage job. Seventy-eight percent of all job openings in Washington don’t pay enough for that parent to survive. Quite simply, many King County families aren’t making ends meet, and $15 is not a living wage. Our improved minimum wage falls short by other measures as well. A Center for Economic and Policy Research report finds that, had the federal minimum wage kept up with economic productivity, it should have been $21.72 an hour in 2012, about three times the current minimum wage. It is also worth noting that several exceptions have watered down the policy. The Seattle minimum wage is phased-in, getting to $15 an hour gradually between 2017 and 2021, depending on the size of the business and whether it offers health care. The Seattle wage schedule gets us closer to an actual living wage than we’ve been in the history of our living wage study, which goes back to 1999. But in reality, it remains a modest step in the right direction. In the end, the triumph of $15 is that it was a bottom-up approach to progressive policy change that succeeded. 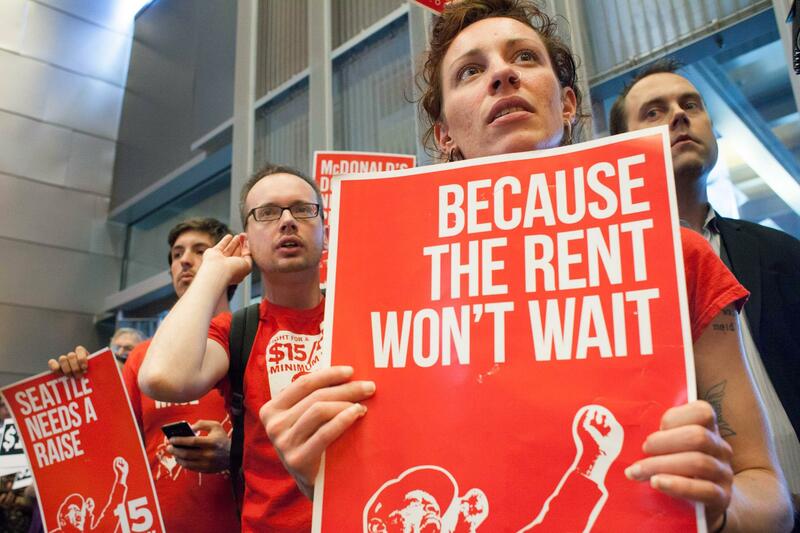 After all, it was Seattle’s low-wage workers who first had the courage to demand a $15 minimum wage — and they got it. Many families face impossible balance sheets, paying living costs, maybe student loan debt or medical bills, and are having excruciating kitchen table conversations. A $15 minimum wage is a huge step in the right direction, but we must remember that this is only the beginning in the movement for a more prosperous Washington and America. Jill Reese is the Associate Director of the Alliance for a Just Society, a Seattle-based national network of grassroots organizing groups. Visit http://www.allianceforajustsociety.org.